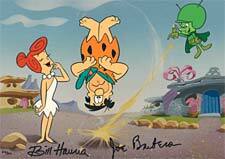 The Great Gazoo flips Fred in this classic moment from the original series. Among the most remembered Hanna Barbera characters, Gazoo appeared (and disappeared) in the 145th episode of The Flintstones in 1965. Gazoo was exiled from his home planet, Zetox, for inventing a device that could destroy the entire universe. As punishment, he was stranded on prehistoric Earth and made to serve the “dumb-dumbs” who found him-Fred and Barney. Gazoo can apparently be seen and heard only by Fred and Barney, animals, children, and his leader the Great Gazam. This fabulous Limited Edition Cel is based on artwork from the original production and is signed by small screen legends Bill Hanna and and Joe Barbera.